Pictured with David Barrett (from left) is Mashell Sourjohn, AARP OK Associate State Director Outreach, Joe Ann Vermillion, AARP OK State President and Eric Schneidewind, AARP National President. 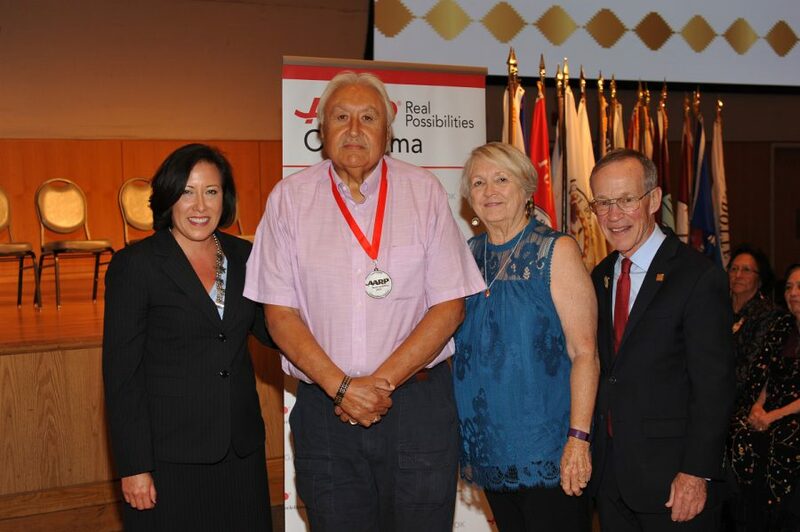 Citizen Potawatomi Nation District 10 Legislator David Barrett and longtime Intensive Services Employment Counselor and CPN Reintegration Program coordinator Burt Patadal are two of this year’s 50 AARP Oklahoma Indian Elder honorees. AARP celebrated 50 elders representing the state’s 39 tribal nations at its ninth annual awards, presented Oct. 3 at the National Cowboy and Western Heritage Museum in Oklahoma City. Medallions were presented in recognition of their lifetime of contributions to their communities, families, Citizen Potawatomi Nation, tribes and the United States. “This year’s AARP Oklahoma Indian Elder Honorees represent what is best about Native American people: love of family, dedication to culture and respect for all people,” said AARP state director Sean Voskuhl in a media statement. The evening began with dinner, a performance by the Oklahoma Fancy Dancers and an invocation/Osage prayer and blessing by Steven Pratt. John Hamilton led an “In Memorium” observance. Voskuhl acted as master of ceremonies and Eric Schneidewind, AARP national president, welcomed the 2017 class of Indian Elder honorees. Cheyenne & Arapaho Tribes member Henrietta Mann received the prestigious Dr. John Edwards Memorial Leadership Award, named after the Chickasaw Nation Supreme Court peacemaker, U.S. Department of Interior arbitrator and former Absentee Shawnee Tribe governor who died in 2014. Mann is founding president and president emerita of Cheyenne and Arapaho Tribal College, which existed in a partnership with Southwestern Oklahoma State University from 2006 to 2015 in Weatherford, Oklahoma. Growing up, Barrett didn’t know much about his tribal heritage. Few others seemed to know about theirs, either. He knew he was a descendant of the Boursaw family, but, at the time information on Citizen Potawatomi Nation wasn’t organized and accessible like it is today. Under the leadership of Citizen Potawatomi Nation Tribal Chairman John “Rocky” Barrett and Vice-Chairman Linda Capps, he said he’s proud that he’s been able to help change that. The District 10 Legislator said he works to ensure the Nation’s future remains strong, while incorporating and preserving the knowledge and lessons of its past. He graduated from Tecumseh High School in 1966, and then attended Murray State Junior College before transferring to the University of Oklahoma and earning his bachelor’s degree in accounting. From there, he enlisted in the U.S. Navy, serving as an electric radar technician on the USS Durham (LKA-114), a landing craft and attack cargo ship. During his enlistment, Barrett stopped in Hong Kong; Da Nang, Vietnam; Sydney, Australia; the Philippines and Japan during the Vietnam War. He said he is proud to have served his country. He paused and smiled as he shared a memory. While at sea, he would load himself into a small boat — with a 50-pound VRC-46 mobile radio strapped to his back — and meet a Navy vessel to climb aboard and fix its radar before making the trip back to the USS Durham. He also realized that, while in the Army, he had formed special bonds with other Native servicemen and women. “I have a very happy heart — a proud heart,” he said. He married his wife Connie in 1971 and lived in San Diego until 1982, when they moved to Bethel Acres, Oklahoma, and started a family. He researched his ancestry — what he could find of it. 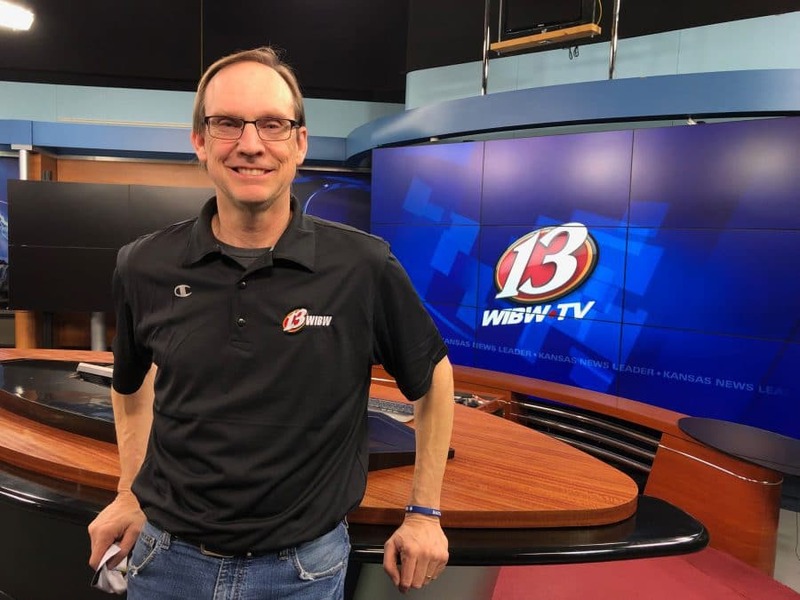 He also worked as a financial controller for companies like Worthington Pump Corporation while earning a master’s degree from Oklahoma City University. He also became an entrepreneur, helping start Windsor Door Company and investing in stocks, rental properties and more. He joined the CPN Legislature in 2008 after serving on several boards and helping lead the Nation’s Grievance Committee. His sense of humor — and his diligence — is apparent today as he helps lead Citizen Potawatomi Nation’s District 10. He’s also treasurer of CPN’s Veteran Organization and participates in its Color Guard. “I’m only 69, and here I am receiving an AARP Indian Elder Award,” Barrett said, then laughed. “I still seek wisdom from elders — conversations and history and knowledge. … This award is a true honor. Pictured with Burt Patadal (from left) is Mashell Sourjohn, AARP OK Associate State Director Outreach, Joe Ann Vermillion, AARP OK State President and Eric Schneidewind, AARP National President. Patadal “wanted to be more than a counselor,” he told the Hownikan. “I wanted to go to where the heart is.” And the heart of his passion lies within the hundreds of Indigenous people he helps make the transition from incarceration to freedom. Kiowa, Shawnee and Oglala Lakota Sioux, Patadal began working with Citizen Potawatomi Nation 17 years ago. He leads sweat lodges, dances and talking circles inside prisons. He performs drug and alcohol counseling and helps inmates attain vocational training, housing and jobs as they return to society. He also works with CPN’s Healing to Wellness drug court and City of Shawnee courts to help people find needed treatment. “The most satisfying thing about what I do is helping my people,” Patadal said. He also leads community sweat lodges and talking circles for the community and CPN tribal members. Patadal, who attended Indian boarding schools as a child, participated in spiritual sweat lodges as a kid, before the American Indian Religious Freedom Act became law in 1978. Those experiences influenced the trajectory of his life. In the mid-’90s, before joining CPN, Patadal even participated in a prison sweat lodge with high-profile American Indian Movement Indigenous rights activist Leonard Peltier. Peltier was sentenced to two consecutive life terms in 1977 after being convicted of killing two FBI agents during a 1975 armed confrontation that became known as the Pine Ridge Shootout at Pine Ridge Indian Reservation in South Dakota, near Wounded Knee. In the late ’60s and early ’70s, Patadal also marched on Washington with the American Indian Movement (AIM), pushing for indigenous sovereignty, civil rights and land autonomy.